At a recent charitable event in Los Angeles, the press picked up a headline regarding an attendee who bid $19,000 for a piece of art. While this isn&a;rsquo;t normally national news, it became a trending article because the bidder was none other than six year-old Blue Ivy Carter, daughter of Beyonc&a;eacute; and Jay-Z. It might appear excessive for a young child to be raising a paddle at a charitable auction; and the dollar amounts involved are higher than most people can even consider donating to charity. But upon deeper inspection, this story is a powerful lesson on how money can provide a child with feelings of empowerment, charity and resiliency. Further, teaching children about money is a reflection of family values and the family&a;rsquo;s support system &a;ndash; essential elements for raising a financially sound child. Beyonc&a;eacute; and Jay-Z are showing us one way to be model parents in this area. &a;ldquo;More parents are trying to educate their children about finances early. The families I work with try to teach their children how to earn money, save money, and, most importantly, distinguish between needs and wants,&a;rdquo; says Jenna Laski, a Licensed Family and Marriage Therapist in Los Angeles. &l;p class=&q;tweet_line&q;&g;Intention is key in teaching children about money. Parents want to create an environment where a child is shown that actions with money can achieve a variety of long-lasting results, from serving the community to accruing assets. In the case of Beyonc&a;eacute; and Jay-Z, they took their daughter to an auction organized by her grandmother where she was surrounded by family and friends. It was a safe space for making a financial decision, and her actions reflected family values. Her mother, father and grandmother are strong supporters of the involvement of the African American community in the arts. It also allows a child to think about using money to achieve goals. In Blue Ivy&a;rsquo;s case, it was to collect art, which is an important value in her family. It is key that a child have a goal and it is even better if the goal is reinforced by their closest supporter. For most children, it&a;rsquo;s their parents. One of the best goals to consider for a child is that of charity. &a;ldquo;It is essential and crucial for parents to set the mindset early on, around making a positive difference in the world,&a;rdquo; says Laski. If your child loves animals or wants to be a firefighter, for example, there is an opportunity for them to use money to connect with an idea that resonates with them. Beyonc&a;eacute; and Jay-Z used art related to the African American experience, which is something they have probably discussed with their daughter. This approach can easily be applied to whatever issue that resonates with your child. When children are learning about money and empowerment, it is important that they experience both success and failure. Blue Ivy initially bid $17,000 for the acrylic painting of Sidney Pointier, increased her bid to $19,000, but was eventually outbid. &l;p class=&q;tweet_line&q;&g;Negative financial outcomes are part of a normal financial life and should be taught to children. Everyone experiences ups and downs with money. Resiliency with finances is key &a;ndash; to be able to take moments that don&a;rsquo;t work for us and find a way to either turn them around or move on. Ideally when children experience disappointing money decisions, they can pick themselves up, consider what went wrong and try for another financial goal. Blue Ivy did just that &a;ndash; she bid on the next lot of art and won. Ultimately the framework laid out by Beyonc&a;eacute; and Jay-Z with their daughter is one that many parents are working towards for their own children. Raising children today requires parents to focus on how the relationship with money grows. The right teachable moment can leave an imprint that last a lifetime. This entry was posted in Top Stocks on June 30, 2018 by ggkandy. Snap Inc. (NYSE: SNAP) reported first-quarter financial results after markets closed Wednesday. The company said that it had a net loss of $2.31 per share and $149.6 million in revenue versus consensus estimates from Thomson Reuters that called for a net loss of $0.19 per share and $157.98 million in revenue. The same period from last year had a net loss of $0.14 per share and $38.80 million in revenue in revenue. During this quarter, daily active users (DAU) grew to 166 million from 122 million in the first quarter of last year, an increase of 36%. DAUs increased 5% quarter-over-quarter, from 158 million in Q4 2016. Average revenue per user (ARPU) totaled $0.90 in this quarter, an increase of 181% year over year, while ARPU decreased 14% quarter-over-quarter. At the same time, hosting costs per DAU were $0.60, compared with $0.52 in the first quarter of 2016 and $0.72 in the fourth quarter of 2016. On the books, cash, cash equivalents, and marketable securities totaled $3.24 billion at the end of the quarter, versus $987.4 million at the end of December 2016. Shares of Snap closed Wednesday down 1.5% at $22.96, with a consensus analyst price target of $23.43 and a 52-week trading range of $18.90 to $29.44. Following the release of the earnings report, the stock was initially down 18% at $18.80 in the after-hours trading session. State Board of Administration of Florida Retirement System trimmed its holdings in shares of 21st Century Fox (NASDAQ:FOXA) by 3.2% in the first quarter, according to its most recent filing with the SEC. The firm owned 1,652,182 shares of the company’s stock after selling 55,007 shares during the period. State Board of Administration of Florida Retirement System’s holdings in 21st Century Fox were worth $60,619,000 as of its most recent filing with the SEC. Several other large investors have also added to or reduced their stakes in FOXA. Conning Inc. increased its position in shares of 21st Century Fox by 8.1% during the 1st quarter. Conning Inc. now owns 26,052 shares of the company’s stock worth $956,000 after purchasing an additional 1,960 shares in the last quarter. Trexquant Investment LP acquired a new stake in shares of 21st Century Fox during the 1st quarter worth about $854,000. Zions Bancorporation acquired a new stake in shares of 21st Century Fox during the 1st quarter worth about $181,000. Meeder Asset Management Inc. increased its position in shares of 21st Century Fox by 426.6% during the 1st quarter. Meeder Asset Management Inc. now owns 11,585 shares of the company’s stock worth $425,000 after purchasing an additional 9,385 shares in the last quarter. Finally, Advisor Partners LLC increased its position in shares of 21st Century Fox by 19.0% during the 1st quarter. Advisor Partners LLC now owns 22,404 shares of the company’s stock worth $822,000 after purchasing an additional 3,574 shares in the last quarter. 53.61% of the stock is owned by institutional investors. A number of equities research analysts recently issued reports on FOXA shares. Loop Capital started coverage on shares of 21st Century Fox in a research report on Thursday, March 15th. They set a “buy” rating and a $43.00 target price for the company. Pivotal Research reiterated a “hold” rating and set a $35.00 target price on shares of 21st Century Fox in a research report on Tuesday, April 17th. BMO Capital Markets increased their target price on shares of 21st Century Fox from $35.00 to $37.00 and gave the stock a “market perform” rating in a research report on Monday, February 12th. Piper Jaffray reiterated a “buy” rating and set a $44.00 target price on shares of 21st Century Fox in a research report on Friday, January 26th. Finally, Atlantic Securities upgraded shares of 21st Century Fox from a “neutral” rating to an “overweight” rating in a research report on Monday, January 22nd. One analyst has rated the stock with a sell rating, seven have given a hold rating and fourteen have issued a buy rating to the stock. The company has a consensus rating of “Buy” and a consensus target price of $38.33. FOXA opened at $38.04 on Tuesday. The company has a quick ratio of 1.77, a current ratio of 2.16 and a debt-to-equity ratio of 0.98. The stock has a market capitalization of $69.77 billion, a price-to-earnings ratio of 20.81, a P/E/G ratio of 1.84 and a beta of 1.32. 21st Century Fox has a 1-year low of $24.81 and a 1-year high of $39.13. 21st Century Fox (NASDAQ:FOXA) last issued its earnings results on Wednesday, February 7th. The company reported $0.42 earnings per share (EPS) for the quarter, beating the consensus estimate of $0.38 by $0.04. The company had revenue of $8.04 billion for the quarter, compared to analyst estimates of $7.94 billion. 21st Century Fox had a net margin of 13.49% and a return on equity of 19.01%. The company’s revenue for the quarter was up 4.6% on a year-over-year basis. During the same quarter last year, the firm earned $0.53 EPS. equities research analysts forecast that 21st Century Fox will post 1.99 EPS for the current year. Twenty-First Century Fox, Inc, together with its subsidiaries, operates as a diversified media and entertainment company primarily in the United States, the United Kingdom, Continental Europe, Asia, and Latin America. It operates through Cable Network Programming, Television, and Filmed Entertainment segments. Want to see what other hedge funds are holding FOXA? Visit HoldingsChannel.com to get the latest 13F filings and insider trades for 21st Century Fox (NASDAQ:FOXA). During Q4FY2018, Arvind Limited (Arvind) reported 21.3% y-o-y revenue growth to Rs. 2,990 crore. Revenue from the textile segment grew by 9.3% y-o-y to Rs. 1,596.4 crore mainly led by 13% volume growth in the garment segment and 14% revenue growth in the woven segment. Fabric volume also improved from 56 million metres to 60 million meters despite the decline in denim domestic volumes. Further, demerger of businesses such as B&R and Anup Engineering into separate verticals would enhance shareholders value in the near future. Thus, we maintain our Buy recommendation on the stock with an unchanged price target of Rs. 500. Disclaimer:The views and investment tips expressed by investment experts/broking houses/rating agencies on moneycontrol.com are their own, and not that of the website or its management. Moneycontrol.com advises users to check with certified experts before taking any investment decisions. NewMarket Co. (NYSE:NEU) has received a consensus broker rating score of 3.00 (Hold) from the one brokers that cover the stock, Zacks Investment Research reports. One investment analyst has rated the stock with a hold rating. Zacks has also given NewMarket an industry rank of 174 out of 265 based on the ratings given to related companies. Separately, TheStreet cut NewMarket from a “b-” rating to a “c” rating in a research report on Wednesday, February 7th. NewMarket stock traded down $3.88 during mid-day trading on Tuesday, reaching $370.77. 39,573 shares of the company were exchanged, compared to its average volume of 36,249. NewMarket has a twelve month low of $359.17 and a twelve month high of $478.84. The company has a current ratio of 2.93, a quick ratio of 1.60 and a debt-to-equity ratio of 0.95. The stock has a market capitalization of $4.31 billion, a price-to-earnings ratio of 19.74 and a beta of 0.74. NewMarket (NYSE:NEU) last posted its quarterly earnings data on Wednesday, April 25th. The specialty chemicals company reported $5.14 earnings per share for the quarter, missing analysts’ consensus estimates of $5.60 by ($0.46). NewMarket had a return on equity of 35.41% and a net margin of 8.34%. The company had revenue of $589.20 million for the quarter, compared to analyst estimates of $573.20 million. During the same period in the previous year, the business posted $5.39 earnings per share. The firm’s revenue was up 8.5% compared to the same quarter last year. The business also recently disclosed a quarterly dividend, which will be paid on Monday, July 2nd. Shareholders of record on Friday, June 15th will be given a dividend of $1.75 per share. The ex-dividend date is Thursday, June 14th. This represents a $7.00 dividend on an annualized basis and a yield of 1.89%. In related news, Treasurer Cameron D. Warner acquired 264 shares of the firm’s stock in a transaction on Tuesday, May 1st. The stock was bought at an average cost of $377.68 per share, with a total value of $99,707.52. Following the transaction, the treasurer now owns 762 shares of the company’s stock, valued at $287,792.16. The acquisition was disclosed in a document filed with the Securities & Exchange Commission, which is available at the SEC website. 16.91% of the stock is currently owned by company insiders. Several hedge funds have recently modified their holdings of NEU. Capital Analysts LLC raised its stake in shares of NewMarket by 6,961.7% during the 4th quarter. Capital Analysts LLC now owns 49,926 shares of the specialty chemicals company’s stock worth $2,088,000 after buying an additional 49,219 shares in the last quarter. Neuberger Berman Group LLC raised its stake in shares of NewMarket by 19.6% during the 1st quarter. Neuberger Berman Group LLC now owns 177,630 shares of the specialty chemicals company’s stock worth $71,350,000 after buying an additional 29,104 shares in the last quarter. BlackRock Inc. raised its stake in shares of NewMarket by 3.3% during the 4th quarter. BlackRock Inc. now owns 749,685 shares of the specialty chemicals company’s stock worth $297,919,000 after buying an additional 24,128 shares in the last quarter. Eagle Asset Management Inc. purchased a new position in shares of NewMarket during the 4th quarter worth approximately $6,385,000. Finally, Wells Fargo & Company MN raised its stake in shares of NewMarket by 36.8% during the 1st quarter. Wells Fargo & Company MN now owns 47,774 shares of the specialty chemicals company’s stock worth $19,191,000 after buying an additional 12,859 shares in the last quarter. 55.71% of the stock is owned by institutional investors and hedge funds. NewMarket Corporation, through its subsidiaries, engages in the petroleum additives businesses. It offers lubricant additives for use in various vehicle and industrial applications, such as engine oils, transmission fluids, off-road powertrain and hydraulic systems, gear oils, hydraulic oils, turbine oils, metalworking fluids, and in other applications where metal-to-metal moving parts are utilized; and engine oil, driveline, and industrial additives. Abaxis Inc (NASDAQ:ABAX) files its latest 10-K with SEC for the fiscal year ended on March 31, 2018. Abaxis Inc is a developer, manufacturer and marketer of portable blood analysis systems that are used in medical specialties in human or veterinary patient care to provide clinicians with blood constituent measurements. Abaxis Inc has a market cap of $1.91 billion; its shares were traded at around $83.42 with a P/E ratio of 70.69 and P/S ratio of 8.17. The dividend yield of Abaxis Inc stocks is 0.73%. Abaxis Inc had annual average EBITDA growth of 11.10% over the past ten years. GuruFocus rated Abaxis Inc the business predictability rank of 4-star. For the last quarter Abaxis Inc reported a revenue of $67.9 million, compared with the revenue of $58.20 million during the same period a year ago. For the latest fiscal year the company reported a revenue of $244.7 million, an increase of 7.7% from last year. For the last five years Abaxis Inc had an average revenue growth rate of 7.7% a year. The reported diluted earnings per share was $1.17 for the year, a decline of 18.8% from the previous year. Over the last five years Abaxis Inc had an EPS growth rate of 7% a year. The Abaxis Inc had a decent operating margin of 15.8%, compared with the operating margin of 19.58% a year before. The 10-year historical median operating margin of Abaxis Inc is 16.90%. The profitability rank of the company is 7 (out of 10). At the end of the fiscal year, Abaxis Inc has the cash and cash equivalents of $46.3 million, compared with $91.3 million in the previous year. The long term debt was $0.18 million, compared with $0.28 million in the previous year. Abaxis Inc has a financial strength rank of 8 (out of 10). At the current stock price of $83.42, Abaxis Inc is traded at 66% premium to its historical median P/S valuation band of $50.24. The P/S ratio of the stock is 8.17, while the historical median P/S ratio is 4.92. The intrinsic value of the stock is $19.32 a share, according to GuruFocus DCF Calculator. The stock gained 68.03% during the past 12 months. Chief Technology Officer Kenneth Aron sold 1,533 shares of ABAX stock on 05/22/2018 at the average price of $83.11. The price of the stock has increased by 0.37% since.Director Prithipal Singh sold 20,000 shares of ABAX stock on 05/18/2018 at the average price of $83.31. The price of the stock has increased by 0.13% since.Managing Director-Europe Achim Henkel sold 6,000 shares of ABAX stock on 05/08/2018 at the average price of $68.06. The price of the stock has increased by 22.57% since. For the complete 20-year historical financial data of ABAX, click here. 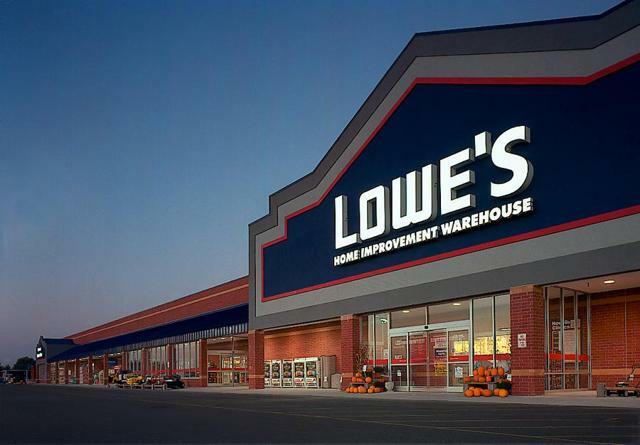 Lowe’s (NYSE:LOW) confirmed this past week that home improvement might be the one good story early this year in an otherwise struggling retail space. The company delivered a top- and bottom-line beat that sent the stock soaring +10% between Tuesday’s session and the end of the trading week. The strong performance was reported not long after peer Home Depot (NYSE:HD) released its own 4Q beat, on February 21st. Today, I look at both companies and try to decide which stock seems to be the most compelling buy between the two. The table below highlights some of the key metrics that I pay attention to when assessing the health of a business or attractiveness of a stock. Before going into any detail, I would point out that there are remarkably more similarities than fundamental differences between the two companies. This may not come as a surprise, as the undisputed numbers 1 and 2 players in the home improvement industry serve a very similar customer base and offer a similar selection of goods and services. Gross margins are nearly identical, although Home Depot seems to have been doing a better job managing opex and producing better op margins lately. 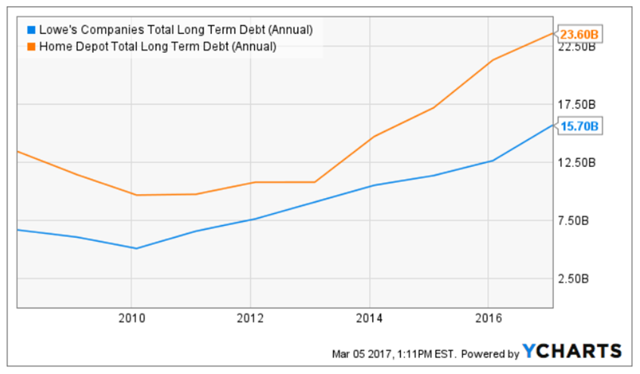 In my Home Depot earnings review, I expressed my concerns over the company’s high levels of debt, which have been increasing consistently since the end of the 2008 recession (see graph below). But Lowe’s is relatively much more indebted than its peer, with net debt reaching over 230% of the company’s FY16 op profits and 20% of market cap (vs. Home Depot’s 82% and 12%, respectively). Peeking into the next couple years, it looks like the Street is expecting both retailers to perform very much in line, with revenues forecasted to go up in the mid-single digits in both cases. Home Depot has called for comparable store sales growth to reach 4.6% in FY17, compared to Lowe’s 3.5%. On an EPS basis, Lowe’s should grow a bit more aggressively, at the mid-teen level vs. Home Depot’s low teens, as the North Carolina-based company expects to play catch-up and improve op margins in FY17 by 120 bps, including extraordinary items. On valuation, LOW appears to be more conservatively priced by a few turns on a P/E basis: 17.6x compared to HD’s 20.5x. But once the higher debt levels are taken into account, the difference becomes less meaningful. And considering Home Depot’s recently revamped dividend policy, which now generates a yield of 2.4% that is 70 bps better than Lowe’s, I see both stocks priced very similarly. 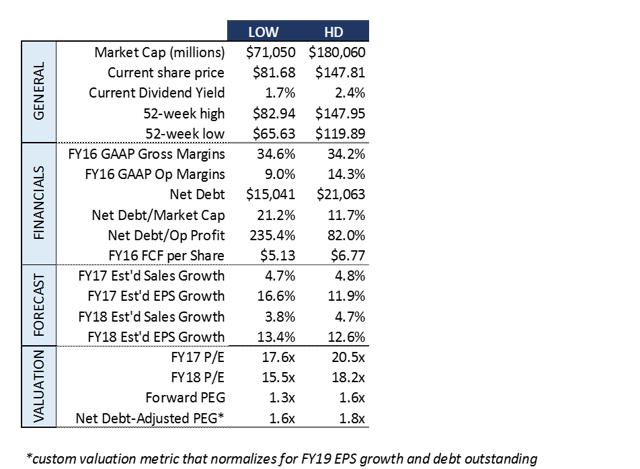 In the end, I believe HD to be the best buy in the home improvement space, although by a narrow margin. I believe the stock’s more aggressive valuation justifies the company’s more conservative debt levels and more enticing and shareholder-friendly dividend policy. Home Depot continues to lead the industry over its key competitor Lowe’s and seems to be the safest investment alternative between the two. The days when LOW and HD could be bought at a trailing P/E of 12x, in 2008-2009, are unfortunately long gone. But I believe a balanced portfolio should still have room for stocks that are well positioned to deliver amid a still ongoing housing sector recovery. Note from the author: Follow me as I build a risk-diversified portfolio designed and back-tested to generate market-like returns with lower risk. I call it the Storm-Resistant Growth portfolio. The very early results have already exceeded my expectations. Take advantage of the 14-day free trial, and get immediate access to the content and the community. About this article:ExpandAuthor payment: $35 + $0.01/page view. Authors of PRO articles receive a minimum guaranteed payment of $150-500. Become a contributor »Tagged: Investing Ideas, Quick Picks & Lists, Services, Home Improvement StoresProblem with this article? Please tell us. Disagree with this article? Submit your own. Federal Reserve Chairman Jerome Powell said financial markets have gotten the message on the U.S. central bank’s plan for gradual interest-rate increases and “should not be surprised” by its actions. “Fed policy normalization has proceeded without disruption to financial markets, and market participants’ expectations for policy seem reasonably well aligned with policymakers’ expectations,” Powell said Tuesday at a conference sponsored by the International Monetary Fund and Swiss National Bank in Zurich. “Markets should not be surprised by our actions if the economy evolves in line with expectations,’’ he said, while also noting the normalization of monetary policies in advanced economies “should continue to prove manageable” for emerging-market economies. U.S. central bankers have raised the benchmark lending rate six times since December 2015, including at their meeting in March, and penciled in two or three more increases this year. The gradual pace of tightening has kept financial conditions easy, and provided support for continued growth in the labor market and economy while steadily moving inflation back toward the Fed’s 2 percent target. The policy was so well telegraphed that financial conditions eased after the rate hikes. Powell said the role of U.S. monetary policy “is often exaggerated” as a force contributing to financial conditions in other economies, though spillovers do occur because of the dollar’s role as a widely-used reserve currency. The Fed chairman also warned that the linkages between monetary policy, asset prices, and the “mood” of global financial markets are not fully understood. “Risk sentiment will bear close watching as normalization proceeds around the world,” Powell said. When inheriting an IRA, Roth IRA or other retirement account, it can be tempting to cash out. In many cases, taking advantage of the provisions in current law to stretch the account would lower the tax bill and the usefulness of the funds. Q.: You stated in a prior question that if you inherited a Roth IRA, you would be subject to RMD. Id like to know how that works. A.: Frank, yes inherited Roth IRAs are subject to Required Minimum Distributions (RMD). Many retirees dread RMD on their IRAs and other retirement accounts because they dont need the money and dont want to pay the taxes that result from a distribution. Inherited Roth accounts are different. In most cases, distributions will be tax free. If you dont need the money, you take just the minimum amount leaving the rest to grow. This results in a larger pool of tax-free funds that can be used later than if you take the money out faster. If you take the first RMD from the Inherited Roth IRA by Dec. 31 of the year after the year of the Roth IRA owners death, you can draw down the account over your life time. This is commonly referred to as a stretch Roth IRA because you are stretching distributions over many years. You always have the option to take more than the minimum and can empty the account at any time. If you do not take the first RMD on time, you must distribute the entire account by the end of the fifth tax year after the year of the owners death. Once out of the Roth environment, those funds are subject to tax based on how they are invested. Here is how the RMD on an Inherited Roth IRA works. You die in 2017 (sorry about that) and named your son as the beneficiary of your Roth IRA. Say he will be 50 years old on Dec. 31, 2018. According to the IRS schedule (Appendix B, Table I) for inherited accounts, his factor is 34.2. He should take the Dec. 31, 2017 account value and divide by 34.2. That is the RMD that must be removed by the end of 2018. It doesnt matter how many distributions he takes or when during 2018 he takes them, as long as the total of all the distributions in 2018 equal or exceed that RMD amount, he will be on a stretch program. For the RMD retirees face on their traditional IRAs, they must refer to their IRS scale annually. He does not refer to the IRS scale in future years for inherited accounts. He simple reduces the dividing factor by one every year going forward. So, for 2019, he would take the Dec. 31, 2018 balance and divide by 33.2. For 2020, he takes the Dec. 31, 2019 balance and divides by 32.2. For 2021, its the Dec. 31, 202 balance divided by 31.2, and so on until the account is empty. If you have a question for Dan, please email him with MarketWatch Q&A on the subject line. Dan Moisands comments are for informational purposes only and are not a substitute for personalized advice. Consult your advisor about what is best for you. Some questions are edited for brevity. Bullish sentiment hasnt soared so much or so fast as to sabotage the stock markets rally. Thats the good news. But you cant let down your guard. Even if its not at an extreme, bullishness has grown markedly over the past couple of weeks. And, given investors manic-depressive mood swings, bullishness could reach dangerous extremes in a matter of days. The HNNSI rose as high as 57.6% last week, for example, before dropping back at weeks end to 40.4%. As you can see from the chart below, this most recent reading is well-below the extreme levels that have accompanied the short-term market tops of the past year-and-a-half. How high must the HNNSI rise to signal excessive bullishness? There is no one magic number, but notice that the HNNSI has been 88% or higher at short-term since the beginning of last year. At the stock markets January high, for example, the HNNSI got as high as 89%. In mid-March, when the Nasdaq Composite was actually above where it stood in January, the HNNSI rose to an even higher level 92%. So the first early warning signal that bullishness is at dangerous levels would be when the HNNSI and similar sentiment indices get as high as they were at the January or March tops. The second thing to watch for: How investors behave in the wake of the next bout of stock market weakness. It would be an encouraging sign if they quickly run for the exits as happened in February and late March, for example, which is one reason why contrarians were willing at that time to give the stock market the benefit of the doubt despite the markets turmoil. It would instead be a bad sign if the timers stubbornly cling to their bullishness in the wake of any weakness. The textbook illustration of such stubborn bullishness was how the HNNSI reacted in early 2000 to the bursting of the internet bubble. In the first two weeks after that bursting, the Nasdaq Composite fell by more than 10% enough to satisfy the semi-official definition of a correction. Yet the HNNSI over those two weeks actually jumped by more than 30 percentage points. Bottom line: Look for extreme levels of bullishness that persist in the face of any market weakness. Since were not there yet, sentiment over the near term should not be an impediment to the rally continuing.